Pete of /Film knows of my ongoing love/loathe/love relationship with Smallville, and I’m pretty sure he regards it with a level of incredulity and amusement normally reserved for any sci-fi film starring Marky Mark. And justifiably so. Yep. There it is. “No experience needed.” Explains a lot, doesn’t it? 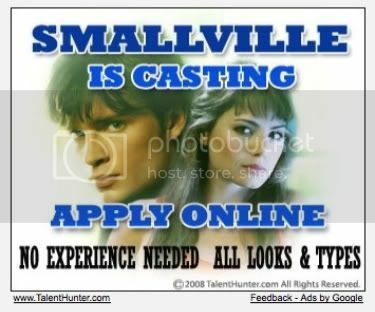 Finally, what we’ve known all along has been confirmed: The producers of Smallville follow a philosophy that a cast with enough innate hotness will obviate any need for acting training or, you know… talent. Ever wonder why Kristen “Lana Lang” Kreuk’s inability to broaden her acting range beyond “moping” and “angry moping” was tolerated for so many years? Why doe-eyed, blank-faced Tom Welling remains the tentpole of this series in its eighth season? It’s hotness, people, the compelling, distracting, and obfuscating power of the hotness! In fact, I’m pretty sure the chick playing Lois Lane is actually a pretty decent actress. But I’ll never know for certain while her fantastic and prominently-featured breasts continue to cloud my judgment, now will I? @Gregory: I enjoy non-sequiturs as much as the next guy, but I think you’ve got the wrong post. Actually, I read a blog post by The Office’s Jenna Fischer about these exact ads and they’re totally fake. Apparently they have them for The Office on some sites as well.